Fugitive Libyan dictator Muammar Qaddafi was killed in fighting around his hometown Thursday, Libya's prime minister confirmed after hours of speculation surrounding his death. "We have been waiting for this moment for a long time. 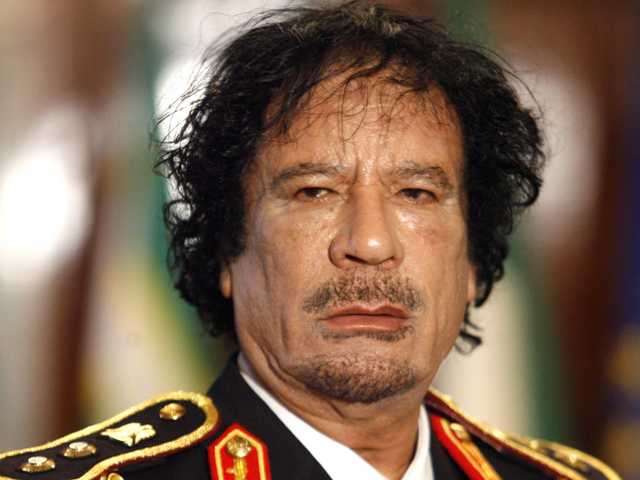 Muammar Qaddafi has been killed," Prime Minister Mahmoud Jibril told a news conference in the capital Tripoli. Libyan fighters captured Sirte, Qaddafi's hometown and the last bastion of loyalist resistance, earlier Thursday. Shortly after, reports of Qaddafi's capture and subsequent death began to swirl. The 69-year-old Qaddafi is the first leader to be killed in the Arab Spring wave of popular uprisings that swept the Midde East, demanding the end of autocratic rulers and greater democracy. Qaddafi had been one of the world's most mercurial leaders, dominating Libya with a regime that often seemed run by his whims and bringing international condemnation and isolation on his country for years. His death decisively ends a regime that had turned Libya into an international pariah and ran the oil-rich nation by the whims and brutality of its notoriously eccentric leader. Libya now enters a new era, but its turmoil may not be over. The former rebels who now rule are disorganized, face rebuilding a country stripped of institutions, and have already shown signs of infighting, with divisions between geographical areas and Islamist and more secular ideologies. Initial reports from fighters said Qaddafi had been barricaded in with his heavily armed loyalists in the last few buildings they held in his Mediterranean coastal hometown of Sirte, furiously battling with revolutionary fighters closing in on them Thursday. At one point, a convoy tried to flee the area and was blasted by NATO airstrikes, but Jibril specified Qaddafi was not killed by the strike. Most accounts agreed Qaddafi was shot to death by fighters. The video shows a wounded Qaddafi with a blood-soaked shirt and bloodied face leaning up against the hood of a truck and restrained by fighters. They then push him toward another car, as he shouts and struggles against them. The body was then paraded through the streets of the nearby city of Misrata on top of a vehicle surrounded by a large crowd chanting, "The blood of the martyrs will not go in vain," according to footage aired on Al-Arabiya television. The fighters who killed Qaddafi are believed to have come from Misrata, a city that suffered a brutal weeks-long siege by Qaddafi's forces during the eight-month long civil war. Abdel-Jalil Abdel-Aziz, a doctor who was part of the medical team that accompanied the body in the ambulance to Misrata, said Qaddafi died from two bullet wounds, to the head and chest. Imad Moustaf, a rebel fighter who said he witnessed Qaddafi's death, told GlobalPost's James Foley that Qaddafi was shot in the head and near his heart on the outskirts of Sirte. Moustaf said the former leader had been hiding in a hole surrounded by bodyguards. Another fighter told the BBC that Qaddafi yelled out "don't shoot" after being discovered. According to the Telegraph's Ben Farmer, who has been to the site in Sirte where Qaddafi was allegedly found, Qaddafi and his bodyguards had taken refuge in a drain after their convoy was struck by a NATO airstrike and were discovered there by TNC fighters. NATO did acknowledge it hit a convoy of Qaddafi's loyalists fleeing Sirte on Thursday morning "which were part of a larger group maneuvering in the vicinity of Sirte." France's defense minister later confirmed it was a French jet that opened fire on the convoy. Secretary of State Hillary Clinton, speaking from Afghanistan, told CBS News correspondent Whit Johnson that the capture Qaddafi would be a significant development in Libya, but also said she did not expect his capture would end the fighting there. Clinton spoke before the U.S. was informed that Qaddafi had been confirmed dead. Celebratory gunfire and cries of "Allahu Akbar" or "God is Great" rang out across the capital Tripoli. Cars honked their horns and people hugged each other. In Sirte, the ecstatic former rebels celebrated the city's fall after weeks of bloody siege by firing endless rounds into the sky, pumping their guns, knives and even a meat cleaver in the air and singing the national anthem. The death of Qaddafi adds greater solidity to that declaration. It rules out a scenario that some had feared -- that he might flee deeper into Libya's southern deserts and lead a resistance campaign against Libya's rulers. Libya's Information Minister Mahmoud Shammam said one of Qaddafi's son, Muatassim, was also killed in Sirte. Justice Minister Mohammad al-Alagi said that another Qaddafi son and one-time heir apparent, Seif al-Islam, was captured wounded by revolutionary fighters and is in a hospital. Al-Alagi said he had sustained a gunshot wound to the leg. Sirte's fall caps weeks of heavy, street-by-street fighting as revolutionary fighters besieged the city. Despite the fall of Tripoli on Aug. 21, Qaddafi loyalists mounted fierce resistance in several areas, including Sirte, preventing Libya's new leaders from declaring full victory in the eight-month civil war. Earlier this week, revolutionary fighters gained control of one stronghold, Bani Walid. By Tuesday, fighters said they had squeezed Qaddafi's forces in Sirte into a residential area of about 700 square yards but were still coming under heavy fire from surrounding buildings. In an illustration of how heavy the fighting has been, it took the anti-Qaddafi fighters two days to capture a single residential building. Reporters at the scene watched as the final assault began around 8 a.m. Thursday and ended about 90 minutes later. Just before the battle, about five carloads of Qaddafi loyalists tried to flee the enclave down the coastal highway that leads out of the city. But they were met by gunfire from the revolutionaries, who killed at least 20 of them. The Misrata Military Council, one of the command groups, said its fighters captured Qaddafi. Another commander, Abdel-Basit Haroun, said Qaddafi was killed when the airstrike hit the fleeing convoy. One fighter who said he was at the battle told AP Television News that the final fight took place at an opulent compound for visiting dignitaries built by Qaddafi's regime. Adel Busamir said the convoy tried to break out but after being hit it turned back and re-entered the compound. Several hundred fighters assaulted. "We found him there," Busamir said. "We saw them beating him (Qaddafi) and someone shot him with a 9mm pistol ... then they took him away." After the battle, revolutionaries began searching homes and buildings looking for any hiding Qaddafi fighters. At least 16 were captured, along with cases of ammunition and trucks loaded with weapons. Reporters saw revolutionaries beating captured Qaddafi men in the back of trucks and officers intervening to stop them. In the central quarter where Thursday's final battle took place, the fighters looking like the same ragtag force that started the uprising eight months ago jumped up and down with joy and flashed V-for-victory signs. Some burned the green Qaddafi flag, then stepped on it with their boots. They chanted "Allah akbar," or "God is great" in Arabic, while one fighter climbed a traffic light pole to unfurl the revolution's flag, which he first kissed. Discarded military uniforms of Qaddafi's fighters littered the streets. One revolutionary fighter waved a silver trophy in the air while another held up a box of firecrackers, then set them off.